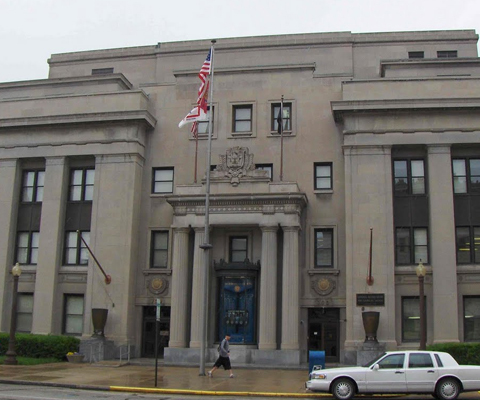 The National Headquarters of The American Legion is a large four-story building located near the Indiana War Memorial Plaza, a five-block area in downtown Indianapolis listed on the National Register of Historic Places. The $2.5 million headquarters building features Indiana limestone, and is considered one of the finest structures of its kind. It is a gift to the Legion from the people of Indiana. 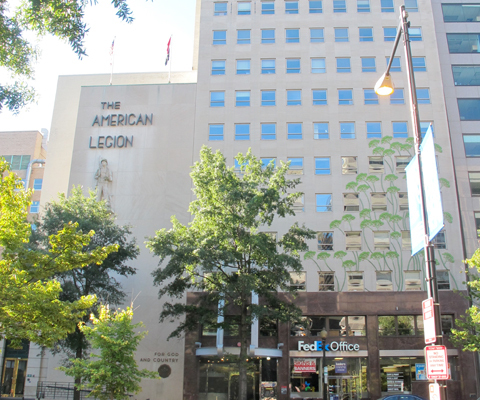 The American Legion Mall is right next to National Headquarters. It features a sunken garden, with a cenotaph and four Art Deco columns topped with stylized golden eagles. Built in 1931, the cenotaph is a tribute to the Hoosiers who gave their lives in World War I. National Headquarters includes the offices of the national commander, national adjutant and executive director. It also houses the historical archives and library, the National Executive Committee room, the art gallery, the museum, finance operations, and editorial offices for The American Legion Magazine, the Dispatch and the Online Update, as well as offices for Internal Affairs, Americanism, Children & Youth, Public Relations, and Convention & Meetings. Since 1934, the Legion’s Washington offices have been located on K Street, three blocks from the White House. The original brownstone building was replaced by an office building dedicated on Aug. 14, 1951, by President Harry Truman. Four decades later, the building received a major renovation and was rededicated on Feb. 25, 1990, by then-VA Secretary Edward Derwinski. The Washington building also has an office for the national commander, to support his frequent visits to the halls of Congress to discuss political issues that affect veterans, servicemembers and their families. The building also includes offices for the executive director, as well as Legislative, Veterans Affairs & Rehabilitation, Veterans Employment and Education and National Security. 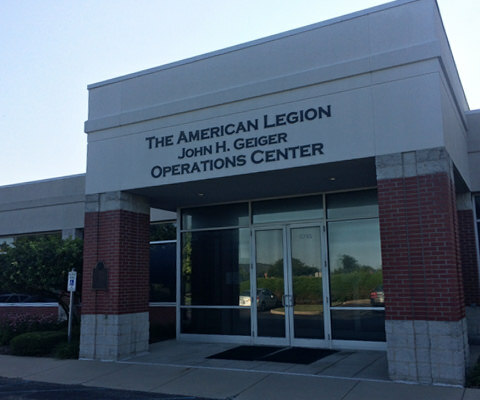 Historic Fort Benjamin Harrison, with its rich military history, is a perfect fit as the home of the Legion's John H. Geiger Operations Center. Located in Lawrence, Ind., just outside Indianapolis, Fort Harrison welcomed the Legion in 1999 with a brand-new 64,000-square-foot facility.